This balsamic and brown sugar glazed pork loin roast is an excellent choice for a Sunday dinner or holiday meal, and the leftovers can be used in sandwiches, hash, and casseroles. Use a top loin roast, a sirloin roast, or a rack or pork (rib roast) in the recipe. This pork loin is seasoned and then roasted to perfection. Before the roast is done, it's glazed with a simple mixture of brown sugar, mustard, and balsamic vinegar. Serve this great tasting pork roast with mashed potatoes and your favorite vegetable side dishes. Steamed broccoli, green or wax beans, and peas are good vegetable choices or serve the roast with a side dish casserole. Sweet potatoes and bread or cornbread dressing are also great with pork. Use a food thermometer to determine doneness. Check the roast near the end of the cooking time with an oven probe, a dial-type or meat thermometer, or an instant-read thermometer. See the timetable below the recipe for approximate cooking times. Line a shallow roasting or baking pan with foil and place a rack in the pan. Rub pork roast all over with cut sides of the garlic; sprinkle with salt and pepper. Place the roast on the rack in the prepared pan. Roast in the preheated 350 F oven for about 2 hours (see the timetable below). Brush with glaze (see below) about 20 to 30 minutes before the pork is done. 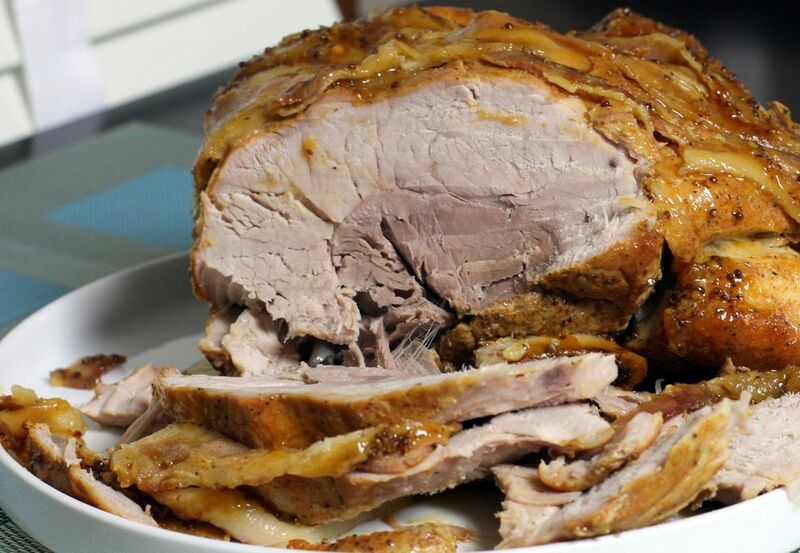 The pork should register between 145 F to 160 F when a food thermometer is inserted into the thickest part of the roast, not touching bone. According to USDA guidelines, pork must be cooked to the minimum safe temperature of 145 F.
Brown Sugar Glaze: Combine glaze ingredients in a saucepan; blend well. Stir over medium-low heat until bubbly. Set aside. Let the roast rest for 10 minutes before slicing.